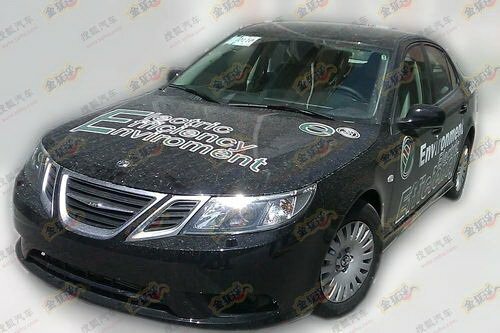 China Car Times has some pictures of BAIC's electric based Saab 9-3 out testing. According to CCT, Beijing which is the home town of BAIC, "are planning to turn Beijing into a paradise for electric vehicles which will include the option of foregoing the monthly lottery for a license plate, instead all EV buyers will be given a license plate instead of waiting for their turn at the license plate lottery, healthy subsidies are also being made available for EV buyers." So who will launch an electric Saab based car first? Saab og BAIC? On Friday last week the production at Saab Automobile in Trollhättan was restarted. Around 100 cars were built the first day. Today, Monday, another 200 cars were built. The normal building rate is around 230 cars each day. In other words, today the factory was close to full speed. "It is going perfectly. We have produced 200 cars. We had a bit slower pace in the morning when we started up. We can reach up to 230, but 200 is quite good I must say. At four o'clock we stopped and we will start again tomorrow," said Eric Geers, Executive Director Communications at Saab, told Göteborgs-Posten. He continued saying that at the moment there are reasons why this rate should not be kept up the rest of the week. Göteborgs-Posten has also had a talk with Ana Trollhättan, which is big Saab dealer in Trollhättan. They could report that costumers who have been waiting now show new interest in buying Saabs. "Something is absolutely happening. There was a rush of people on Friday, but then the buy must be discussed at home and with the bank," Henry Ivansson from the ANA dealer said. "We feel positive. People are more satisfied and happier and then everything is much easier." Those who have been readers of my blog since last year might remember that I had a not so very pleasant experience with my new Saab 9-5 when it wouldn't start. This is a well known problem and has also been documented by Swedish car magazine Vi Bilägare. What happens is when you press the ignition button to start the car, you get a message that the "Steering lock needs service" (translated from Swedish "Rattlås behöver service" - I don't know what the precise message is in English) and the car locks up with the ignition on but will not start. When it happened to me, the car wouldn't lock the doors either and it flashed the indicator lights. But 15 minutes later it started like nothing had happened. For me this hasn't been a big issue. I had the problem once and got a good advice to turn power of with the start/stop button if this message appeared. Since then I have gotten the same message in the info display two or three times and I have followed the advice and the car started with no problem. Friday was a joyful day when the production at Saab was restarted. But happy faces was not just seen at Saab. Also the suppliers and their employees were happy to once again be going to work and building parts for Saab. And it is important for us to remember that a stop at Saab affects more than just the workers at Saab. Thousands of workers elsewhere in Sweden and the rest of the world are also affected. We should also pay a tribute to those companies and their employees who were a big part of the restart of the Saab production on Friday. Trollhättan newspaper TTELA has visited IAC in Färgelanda and has written an article about them. Below is a translation. It was not just at Saab that production started yesterday, but also at hundreds of subcontractors. 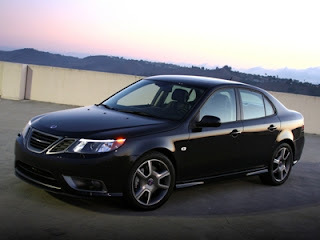 - It's good that Saab is being restarted. Now the tempo will increase here again, says forklift driver Glenn Kvist at IAC in Färgelanda. IAC was one of the suppliers who first stopped deliveries to Saab when they were not paid. They were also early to give 200 people notice of unemployment, which they did on April 28. 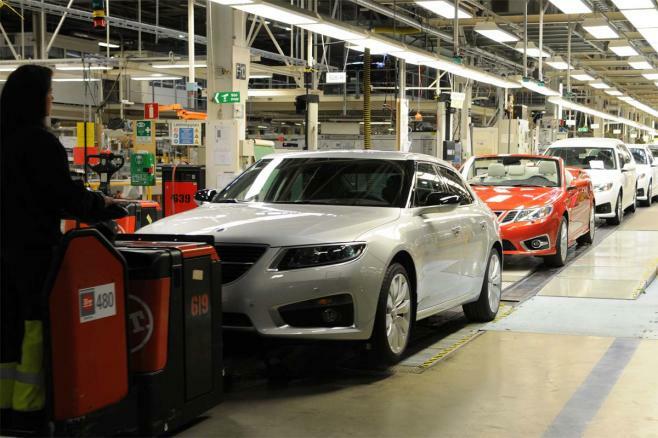 For 56 part-time employed yesterday would have been their last working day if Saab had not restarted its production. - I would have worked my last day here today. But now it has been extended from Monday to Wednesday next week. It was not very pleasant to get the layoff notice, but understandable given that production stalled in Trollhättan, says Markus Eklund who assembles door panels. When the layoff notice came it was no surprise for most of the people at the company. - I was touched when I walked around on the evening shift and explained the situation of those affected. 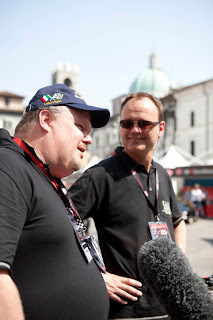 They showed great understanding, says production manager Lars-Ove Bryngelsson. The factory in Färgelanda employs 300 people, including 250 organized workers. Production for Saab amounts to about half the business. - Many have taken out leave and holiday, which was perfect timed around Easter weekend. Some have also worked in other factories, says Lars-Ove Bryngelsson. Those who have been at work have spent time cleaning, painting and education. Lars-Ove Bryngelsson makes the comparison of starting the production at Saab and at the suppliers with a large ship. - If there is a stop somewhere, it's a long process to start again and there will be some disruptions in the beginning. During the stop some people have also left, including the temps, so some of the staff have had to learn new tasks. IAC manufactures instrument panels and door panels, and a variety of injection molded plastic parts for Saab. They deliver directly to the production line and the first truck left the factory at 12 o’clock Friday. In addition to manufacturing for Saab, IAC also delivers to Volvo cars and Scania trucks. - We are also starting with production for Volvo Trucks, says Lars-Ove Bryngelsson. He gives a tour of the 27,000 square meter factory building. - I've been to Gothenburg and worked a few days during the stop. It's great to be back. People do of course need their job, says Marianne Ljungqvist who started working at 5:42 on Friday morning. She is team leader for the production of instrument panels. Currently they are twelve people, but when Saab gears up they will increase the workforce to 24. If sitting in that car doesn't make your tummy tickle then you better get a Saab JAS 39 Gripen fighter jet instead. In these days of Saab and Pang Da meetings with politicians and bureaucrats, production restart and press conferences, I am glad to recommend a totally different read. A few weeks ago Saab participated in the Mille Miglia with three Saab 93 cars. 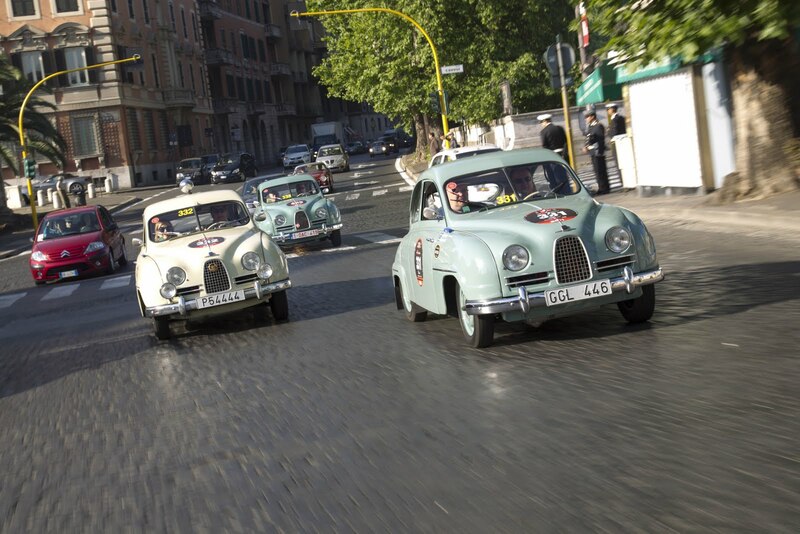 British The Telegraph has a very pleasing article about the race and some of the car manufacturers which participated. Mats Fägerhag obviously talked from his heart when he said "it's a slight exaggeration, but leaving GM felt almost like leaving prison." Tough words, but seemingly so honestly expressed that I think even GM would forgive him. Fägerhag explained Saabs like "fun to drive but also safe, predictable in their handling yet individual in their character." Also Peter Bäckström, Manager of the Saab Museum, shared some wise words with the paper. "The Saab is a strong character. It simply cannot be mainstream and Saab drivers simply cannot be categorised, apart from as individuals." For the rest of the words that describe us and our cars, check out the article at The Telegraph. Today Saab's production in Trollhättan was restarted after a seven week stop. Present was Saab Automobile's CEO Victor Muller and Mr. Pang Qinghua, CEO of Chinese partner Pang Da Automobile Trade. Pang Da is also planned to become part owner of Saab. But for this to happen, first both Swedish and Chinese Governmental agencies needs to approve of the deal, and in addition both the European Investment Bank and General Motors must also give their blessing. To Swedish Radio Victor Muller said that it will take maybe up to two or three months to complete the ownership deal. He also said that Geely's acquisition of Volvo Cars have paved the way and made everything easier for Saab and Pang Da. CEO of Pang Da, Pang Qinghua said that he was very happy to be in Sweden and at Saab in Trollhättan. "Saab is no newcomer to China, for the Chinese customers Saab stands for high technology, safety and environmental friendliness," Qinghua told the press. Victor Muller and Pang Qinghua Photo by Evelina Myrbäck/P4 Väst. 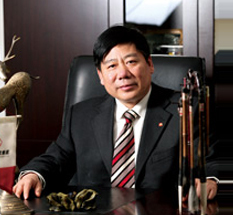 Pang Qinghua continued saying that selling 100,000, 200,000 and even 300,000 Saab cars is possible in China. Victor Muller was a more modest and said that Saab's goal of selling 1,200 Saab in China this year could very well be exceeded. It was also revealed today that there is work remaining to come to terms with all subcontractors and suppliers of Saab. So far Saab has made deals with the most important suppliers. "We're not done with all agreements with all suppliers that need to supply us for the production to be able to run continuously. But we have started with what we needed first to get started," Gunnar Brunius, Vice President Purchasing & Manufacturing at Saab Automobile, said. To watch Pang Qinghua at the press conference today, visit TV4. To watch Victor Muller at the press conference today, also visit TV4. Or see the embedded video below. Around 10 o'clock this morning the production line was restarted at Saab Automobile in Trollhättan. The first car to come down the line was a silver Saab 9-5 Aero XWD, and the second a Saab 9-3 convertible Independence Edition. 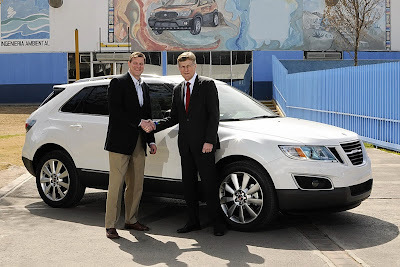 Saab's order bank totals over 8,100 cars, of which 1,600 are Saab 9-4X vehicles to be built by General Motors in Mexico. The remaining 6,500 cars will be built at Saab in Trollhättan. Today around 100 cars will be built and this number will be increased as the supply of parts and compenents is stabilized during the coming weeks. “This is a great day for our company and it is great to see the plant running again. We have gone through a rough patch in recent weeks, but Saab is back in action again. I would like to express my deep gratitude to our fantastic suppliers who have worked so hard with us to make this happen, and to our loyal employees who have constantly stood by our side,” Victor Muller said watching the first car roll off the line. Read more about the restart in Saab's press release. After seven weeks with no new Saab cars being produced, the production at Saab in Trollhättan will be back up and running today. First there will be built a few cars to check that everything is working alright and up to the usual quality. Then full production will commence some time during morning. The production rate will start at around 100 cars. That is less than before the stop when the production was around 220 cars each day. The aim is to be back at around 220 cars next week when the supply of parts and components has stabilized. Saab's CEO Victor Muller will meet the press around lunch time. This evening Sweden's Minister of Enterprise and Energy, Ms. Maud Olofsson, met CEO of Pang Da Automobile Mr. Pang Qinghua and Saab's CEO Mr. Victor Muller. After the meeting Ms.Olofsson said it had been a good information meeting. "Pang Da talked about what opportunities they see for Saab to enter the Chinese market. The company is of course an interesting partner, given that an increase of sales is what Saab needs," Olofsson told Dagens Industri. Pang Da told the Minister that if Saab's sales develop like they believe they will in China, production in Trollhättan will increase. "I think it was good to meet them and hear their description of how they look at Saab's capabilities. Their response was that even when Saab starts production in China, the production in Sweden will continued to be important," Olofsson said. It is the Swedish National Debt Office that will do the ownership review of Pang Da and decide whether the company will be allowed as an part owner of Saab or not. "It was an excellent meeting," was Victor Muller's only comment before he left the Ministry smiling. They were of course driven to Saab's facilities in a new Saab 9-5! As reported earlier today, Pang Da will also meet Sweden's Minister for Enterprise and Energy, Ms. Maud Olofsson, later today at the Ministry in Stockholm. TTELA reports that representatives of Pang Da will also meet with the Swedish National Debt Office (NDO) later today during their visit in Stockholm. The NDO is one of the institutions that will have to decide whether to approve Pang Da as part owner of Saab or not. It is expected that the NDO will need a few weeks to finish their review. A production restart at Saab in Trollhättan on Friday was confirmed from Saab late last night. "We have decided to restart on Friday and will do everything to make it happen", Gunnar Brunius, Vice President Purchasing & Manufacturing at Saab Automobile told Dagens Industri. As reported earlier today, a delegation from Chinese future part owner of Saab, Pang Da, will be at the Trollhättan facilities on Friday to inspect the factory and development facilities. This afternoon Swedish Radio quotes Gunnar Brunius saying "Pieces are falling into place one by one, and right now I see no major storm clouds in the horizon that will prevent this [production restarting] from happening". Sweden's Minister of Enterprise and Energy, Ms. Maud Olofsson, will meet a delegation from Pang Da and Saab later today. The delegation will be in Stockholm to see the Ambassador of China and the Minister will also use the opportunity to meet with Pang Da. To TT the press secretary of the Minister, Johanna Martin, called the planned meeting a courtesy call. At the same time a delegation meets China's Ambassador and the Minister, another group from Pang Da will visit Saab's facilities in Trollhättan. On Friday all visitors from Pang Da will all gather in Trollhättan and the hope is still that the production will be up and running by then. "We are aiming at it, although work with the suppliers are still ongoing, Head of information at Saab", Eric Geers, told TT. At the moment there are three investors/companies who have applied to become shareholder of Swedish Automobile (previously known as Spyker Cars) and thus part owner of Saab Automobile. The first to file an application was Russian banker Mr. Vladimir Antonov. An application for him to become owner was filed on 29 March. The Swedish National Debt Office (NDO) approved him as part owner of Saab on 28 April. Mr. Antonov wants to own up to 29.9 percent of Saab, which would cost him EUR 30 million. In addition it has been reported that he is willing to invest up to SEK 1 billion (approx EUR 110 million). The second to file an application was Gemini Investment Funds Ltd. This application was filed with the NDO 6 May. Gemini already owns 8.11 percent of Swedish Automobile and thus Saab, and needs an approval to own more than 10 percent. Gemini has given Saab a loan of EUR 30 million, and as this loan can be converted into shares, something which is very likely due to Saab's financial squeeze, Gemini needs an approval as their stake surely will increase to more than 10 percent when the loan is converted into shares. Swedish media has reported that Gemini might be connected to Mr Antonov's companies, but it is uncertain what this connection is. There was also filed an application concerning Chinese Hawtai Motor Group becoming part owner, but since Hawtai could not get approval from Chinese authorities, their plans to invest in Saab was cancelled. The third, and as of now the final application to be filed with the NDO, concerns Chinese Pang Da Automobile Trade Co. Ltd. The Chinese company wants to invest EUR 65 million in Saab and get up to 24 percent of the ownership. The application was received by the NDO on 23 May. In addition to the planned investment, Saab and Pang Da plan to cooperate on distribution and sale of Saab cars in China, and also local manufacturing of Saab cars in China. In other words, at the moment there are three parties who want to become part owners of Saab. Just-Auto reports today that Mr. Antonov has been fully informed about Pang Da's planned investment in Saab and he supports it. As Gemini is an investment fund and probably not aiming at being an active owner, they will probably have no objections to neither Mr. Antonov nor Pang Da. So far only Mr. Antonov has been approved by the Swedish National Debt Office (NDO). Gemini and Pang Da are still awating the NDO's decision. In addition, both the European Investment Bank (EIB) and General Motor (GM) needs to approve all three hopeful investors/companies. Both the EIB and GM are taking their time. According to just-auto the EIB "remain tight-lipped today". At the moment it does look like the EIB and possibly GM will be the hurdles Mr. Antonov can have trouble clearing. The EIB has shown earlier that its reluctant to have anything to do with Mr. Antonov. It is unclear how the EIB and GM see Pang Da as possible new part owners. The Swedish Government also needs to approve new owners, but statements from the Minister of Enterprise and Energy, Ms. Maud Olofsson, suggest that the Government will approve the owners if the NDO, the EIB and GM do so first. Finally Chinese Pang Da also needs and approval from China's National Development and Reform Commission (NDRC), which is China's top economic planning body. This approval is very uncertain as Chinese authorities stopped Hawtai's attempt at buying into Saab and is pushing for consolidation of the country's car manufacturers. If they don't agree that a Saab and Pang Da cooperation is the best for China, they will stop the deal. So there you have it. We need 'just' 1, 2, 3,...,11 and 12 YES and Saab is part owned by Mr. Antonov, Pang Da and Gemini. As reported earlier here on Life with Saab, the Russian banker Mr. Vladimir Antonov who is very eager to invest in Saab, last week requested a meeting with Sweden's Minister of Enterprise and Energy, Ms. Maud Olofsson. Swedish Svenska Dagbladet/TT today reports that this meeting took place Tuesday evening at the Ministry. The Swedish Government needs to approve Mr. Antonov as a part owner of Saab before he can make the planned investments in Saab's parent company Swedish Automobile NV (previously known as Spyker Cars). But the Government has said earlier that they will wait for the decision of the European Investment Bank (EIB) and General Motors (GM), who also needs to approve Mr. Antonov, before the Government makes its decision. Ms. Olofsson stressed that this has not change despite the meeting on Tuesday. "We have not had any opinion about Antonov earlier. It is not we who have stopped him from investing in Saab. It is GM and the EIB. If they say yes, the Government is also prepared to say yes. They are stopping the approval now," Maud Olofsson told DI/TT. About the meeting Ms Olofsson said that Mr Antonov "wanted to talk about his thoughts on Saab and Saab's future and why he is eager to step in and invest". When asked what impression she got of him, the Minister said that her impression was that he is entrepreneurial businessman and nice. She continued saying "there are always investors who have a feel for different industries and he is apparently interested in cars and also wants to do business. And that earns respect. He has a positive attitude towards Saab, which I think is good". 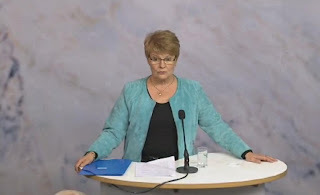 The Minister was also invited to Trollhättan when the delegation from Chinese Pang Da is expected to visit on Thursday, but change of plans suggest that the delegation from Pang Da will be in Stockholm on Thursday afternoon and the Minister will probably meet with the Chinese and Saab at the Ministry. As reported earlier, the aim for Saab is to restart the production on Friday. But to restart production the supply chain of parts and components must be up and running. With more than 800 suppliers and subcontractors, this is a big task. But encouraging reports come in from different media. Today Reuters write that International Automotive Componentes (IAC), which is a large supplier of instrument panels and door panel systems to Saab, has agreed to restart the supplies. "Now we can start deliveries as we have got a payment plan which means that we can handle the cost of starting our production for deliveries to Saab," Marcus Nyman, CEO of IAC Sweden said to Reuters. IAC will however not reach full supply capacity by Friday. Another supplier, Plastal which makes bumpers, has also agreed to restart supply according to NyTeknik. Lear Corporation, which manufacture car seats for Saab, tells TT that they believes that an agreement with Saab will be reached shortly and then they will be ready to deliver supplies on Friday. Hopefully Saab will have come to terms with all the suppliers by Friday so that the manufacturing will be up and running when the delegation from Pang Da visits. Two days ago we learned that the Russian banker Vladimir Antonov, who is eager to invest in Saab, had requested a meeting with Sweden's Minister of Enterprise and Energy. And now head of communication at the Ministry, Håkan Lind, says that the Minister is planning to meet Mr Antonov one of the coming days. "We do not mind meeting him. We are discussing when it is possible to make an appointmend for a meeting between them both in the next few days and a bit later on," Håkan Lind said. At the same time the Ministry stress that they do not have any need for meeting Antonov as it will not affect the European Investment Bank's ownership approval process of Saab. On Thursday and Friday a delegation from Chinese Pang Da Automobile Trade Co. will visit Saab in Trollhättan. This will be an important visit as the impression the delegation gets could affect Pang Da's decision whether or not to order 650 more Saab cars and also if Pang Da wants to carry on with the plans to invest EUR 65 million in Saab. 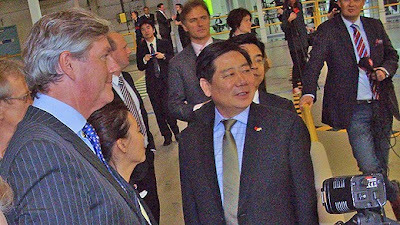 The purpose of the visit to the Saab factory is according to Victor Muller, to show the CEO of Pang Da, Pang Quinghua, both "current and future Saab products, the plant and the technical development." "They will go around and visit the various departments. It will be a busy day," Eric Geers told TTELA. According to the web edition of Göteborgs-Posten, that Chairman and acting President and CEO of Saab, Victor Muller, has asked the Minister of Enterprise and Energy, Maud Olofsson, to participate in the meeting. A Governmental participation should send a powerful signal to China that Sweden stands behind Saab. "The participation and interest from the Government is, especially for a Chinese company, an important factor in building credibility," Muller writes in an email to the Minister Maud Olofsson. In the letter Muller points out that the Government's presence will not be about approving Pang Da's planned future ownership of Spyker and thus Saab, but is "simply a gesture by the Swedish Government to show that it has good relations with Saab and that there is a positive climate for the automotive industry in the country." This afternoon (Monday) the Ministry of Enterprise and Energy had not yet decided whether to accept or decline the invitation and nor had they responded to Victor Muller's email. This according to Erik Bratthall, press secretary at the Ministry. Swedish Göteborgs-Posten reports that the Swedish National Debt Office (NDO) today received an application asking the NDO to approve Pang Da Automobile Trade Co. Ltd as shareholder of Spyker Cars (soon to change name to Swedish Automobile) and thus part owner of Saab Automobile. "It's an application submitted concerning Pang Da who wants to buy shares in Spyker. In addition to the application itself we are now awaiting further information to be able to start our work." said Unni Jerndal Head of Communications at the National Debt Office. To Bloomberg Daniel Barr, the official handling Saab’s case, said that a decision may take three or four weeks after a filing. Earlier today it was reported that Pang Da was in talks with China's National Development and Reform Commission (NDRC) concerning the investment in Saab. In other words, the wheels are on motion! After a weekend of different reports about Saab's deal with Pangda Automobile could be in danger, today Saab has issued a press release stating that Pangda has begun discussions with China's National Development and Reform Commission (NDRC) concerning the investment in Saab. In the press release both Saab's acting CEO Victor Muller and CEO of Pangda Mr. Pang Qinghua express confidence that the deal will be finalized. "Based on our discussions with Pang Da we are confident that Pang Da will get the regulatory approvals needed to formalize the deal. I am very much looking forward to creating a strong business with Pang Da, initially in the distribution and subsequently in the manufacturing of Saab vehicles in China," Victor Muller says in the press release. CEO of Pang Da, Mr. Pang Qinghua, had the following to say: "The initial procedure discussions we have had with the NDRC were done in good spirit and all parties have a good understanding of the process going forward. We remain convinced that we will be able to get all the necessary documentation and approvals to successfully complete the transactions and look forward to our visit at Saab Automobile's headquarters in Trollhättan, Sweden, later this week." The article says that there is a big chance that Chinese authorities will not approve Pangda's EUR 65 million investment in Saab. If so, then let's hope the distribution deal remains. One interesting thing to note though, is that EUR 65 million is "only" $93 million and should only need local approval. The manufacturer of Saab vehicles in China has not yet been selected, and could very well be one of the three big companies. Which would make the consolidation part irrelevant. Yesterday I wrote about a news piece in Svenska Dagbladet (SvD) that Jinhua Youngman Vehicle could have dibs on making a deal with Saab concerning joint venture manufacturing and investment in Saab. As we all know, Saab has signed a MoU with Pangda Automobile Trade Co. for both China manufacturing and investment in Saab. In the joint venture manufacturing the companies has agreed to bring in a third Chinese company, a car manufacturer. 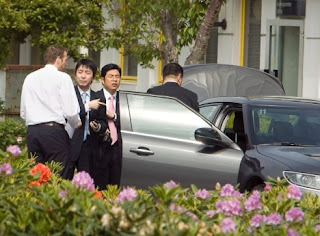 The latest news in SvD was based on information from sources who attended a meeting in Beijing on 18 May between several Chinese car manufacturers and China's National Development and Reform Council (NDRC), which is China's top economic planning body. At this meeting the NDRC supposedly made it clear that Youngman has the first right to make a deal with Saab. Youngman is the only company who has applied to the NDRC to make a deal with Saab, and only one Chinese company can apply at a time. Another source of information about the Chinese auto industry, China Car Times, reports that the purpose of the meeting was to communicate that "Pangda should not be overly competitive behind the backs of other companies, they need to communicate more." To SvD Victor Muller has said that his sources from the meeting, which was first hand sources, did not indicate that Saab's deal with Pangda should be in any kind of danger. And to TTELA Muller said the following about information in the press about the deal with Pang Da being in jeopardy: "There has been a misinterpretation on this issue". Swedish Radio has been in contact with the China expert Frédéric Cho at the Swedish Handelsbanken. His interpretation of the latest confusing news reports is that the Chinese authorities only wants to make sure that the best suitable company partners up with Saab. "They are very careful to ensure that it is the right company that gets involved in this deal and that it has a solid financially and industrially position and the right experience," Frédéric Cho told Swedish Radio. "They watch perhaps also with some concern that there are many Chinese car companies who think this is a good opportunity to get foreign technology, and that there will be a bidding war, an unnecessary bidding," he continued. Cho do not see this as an end to the deal between Saab and Pang Da, but Saab should reflect on the fact that the NDRC has the final say if a deal goes through or not. The past weeks Saab has sought solutions to its financial difficulties both in Russia and China. 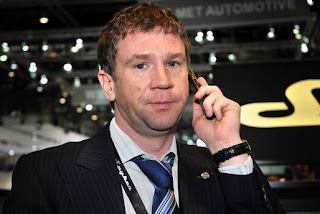 Getting the Russian banker Vladimir Antonov in as part owner of Saab has been a priority of Saab Chairman Victor Muller ever since Spyker Cars (now Swedish Automobile) bought Saab more than one year ago. Almost four weeks ago the Swedish National Debt Office (NDO) announced that they had no objections to Antonov becoming part owner. In addition, the Swedish Government, the European Investment Bank (EIB) and General Motors must approve Antonov as well. All because of the agreement when Saab was sold from GM to Spyker and got a EUR 400 million loan from the EIB, a loan which the Swedish Government guarantees through the NDO. So far the Swedish Government has said that they will wait for the EIB's decision before they decide. And the EIB so far has not announced their decision to the public. TTELA can now report that Vladimir Antonov has sent a letter to the Swedish Minister for Enterprise and Energy, Maud Olofsson, asking for a meeting. In the letter he writes that much of the things written in the press about his involvement in the Saab deal is not correct, or taken out of context. Now he wants a meeting where he can explain his motives, present his resources and plans for Saab and show just how engaged he is in Saab and the brands possibilities for the future. Earlier it has been revealed that despite several previous attempts by Saab the last year and a half to schedule meetings with the Minister for Enterprise and Energy regarding other issues, Olofsson has dismissed nearly each and every request. And in the democracy of Sweden, Saab (and Volvo) does not dare to criticize the Government for total lack of support. Why? Because with the loans from the EIB, which are guaranteed by the Swedish Government, and by being a shareholder in the EIB, the Government more or less has the fate of the auto industry in their hands. And there should be no doubt that the Government clearly has displayed this power the past weeks, by silently watching Saab fighting for its existence instead of applying pressure where pressure should be applied. The question now is if the Minister will show Mr Antonov the courtesy of a meeting, or if she still feels that she has more important issues to take care of than the future of the Swedish car industry. Youngman has dibs on Saab? As you all know, Monday this week Spyker Cars and Saab Automobile signed a MoU with Pang Da Automobile Trade for joint venture distribution and manufacturing of Saab vehicles in China, as well as a Pang Da investment in Saab's parent company. The joint venture manufacturing and Pang Da's investment must be approved by Chinese authorities. Today Svenska Dagbladet can report that on 18 May China's National Development and Reform Council (NDRC) held a meeting in Beijing where they made it clear that Jinhua Youngman Vehicle has the prioritized right to invest in Saab. "NDRC's message at the meeting was that they would strictly enforce existing rules and policies governing foreign investment. This means that it is the company who submitted the application which has the right to make the deal," said an informed source who wishes to remain anonymous. Youngman was the first, and maybe still the only company who has applied to the NDRC to become part owner of Saab. Evidently there can only be one application at a time to become part owner of a foreign car company. This would mean that Youngman must withdraw the application for Pang Da to be able to apply. The reason is that Chinese authorities wants to prevent the Chinese companies from ending up in a bidding fight which will only favor the foreign company. According to Victor Muller, this new information which could impede Pang Da's planned investment in Saab, is not correct. "This is not the information we have received from that meeting and we have received first hand reports from the meeting. The fact that our deal with Pang Da would be blocked is absolutely incorrect, " Muller told SvD. Victor Muller also said that he is certain that Pang Da will become a part owner of Saab. If SvD's sources are correct, then Youngman can, if they want, make big problems for Saab and Pang Da. As always, only time will tell. 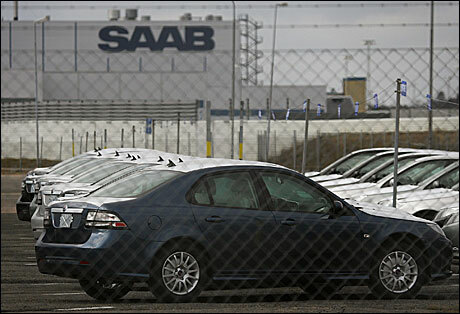 At Saab's manufacturing plant in Trollhättan Sweden, production has been stopped for almost 8 weeks. The reason being a liquidity squeeze that led to the supplies of parts and components being stopped by Saab's suppliers and subcontractors. With fresh money coming in the past two weeks, the aim is to restart production on Friday next week. In Mexico however, Saabs are being built! General Motors, who manufacture the new Saab 9-4X for Saab, has not let Saab's recent financial challenges affect the planned production start of the 9-4X. 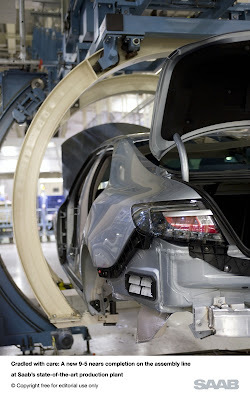 The production started Monday 16 May and all 2011 Saab 9-4X are spoken for. They will start to pop up at the US dealers next month. Isn't that wonderful news? I believe that with the favorable reviews the Saab 9-4X has gotten, this may be the car that puts Saab back on the map in the US! The car that makes the public once again curious about this small Swedish car brand who is unlike all the rest. Kudos to both Saab and GM! Over at Automobile there is a blog entry by Ezra Dyer about why some cars work as commuter cars and others don't. And he makes a very good argument for the Saab 9-3! First he writes some wise words about why a car that is great on the racetrack makes little sense as a daily driver. And isn't that the problem with many car reviews, that they review the car as if everybody who are buying cars are race driver? Which brings me to Saab. As someone who used to spend ninety minutes a day behind the wheel of a Saab, I can tell you that the car had certain talents that couldn't be measured with a stopwatch. For one thing, consider Saab seats. Have you ever heard the expression, "As comfy as a Swede riding shotgun"? No, you haven't, because I just made it up. But it's the truth, I tell you. If you're uncomfortable in a Saab bucket, you have your knees on backward. Four-cylinder Saabs, by dint of their turbochargers, have plenty of low-end torque, yet they get decent fuel economy. And, despite their ambitious sticker prices, you can lease a Saab for roughly the cost of a daily ham sandwich. (I'm only half-joking there—Saab is offering a lease on the 9-3 that works out to about $13 per day.) Think about it like that and a 9-3 starts to make sense. Wow, I think I just justified Saab's business plan for the past twenty years. Those lines are so true. Now just more people need to realize how great Saab cars really are! According to TTELA, Saab now confirms that the upcoming 9-3 replacement, scheduled to launch in October 2012, will come in three main variants: a hatchback, a convertible and a crossover. This information was given at the Spyker Cars (now named Swedish Automobile) shareholders meeting yesterday afternoon when the product strategy was presented. A replacement for the 9-4X is planned for 2015. That would mean that current model will be for sale 4 to 5 years. One of the solutions proposed by Saab to raise money has been to sell Saab's properties and then lease it back. Originally Vladimir Antonov's Convers Group was the intended buyer, but the European Investment Bank stopped that deal for unknown reasons. Now Saab looks for a new buyer for the property. According to Dagens Industri, yesterday the commercial real estate advisor DTZ visited Trollhättan and looked at Saab's property. They were given a tour by Gunnar Brunius, Vice President Purchasing & Manufacturing at Saab. The hope is that DTZ can find a buyer and Saab then can raise money to use in the daily operating of the company. "I am informed about everything that happens at Saab. The more investors who want to contribute funds to Saab, the better," he says to DI. At the general meeting for shareholders in Spyker Cars NV this afternoon, the meeting decided to change the name of the company to Swedish Automobile NV. A wise move as the company's only business as soon as the Spyker Automobile subsidiary is sold as planned, will be the subsidiary Saab Automobile AB. The meeting also decided that a listing on the Stockholm Stock Exchange is not a priority at the time being. "There's no point changing the listing now," Muller told Bloomberg. "We have other things to focus on, including getting a good business going again. We'll have to think about whether it's any point ever listing in Stockholm." The company will however remain listed on the Amsterdam Stock Exchange. Saab manufacturing plant in Trollhättan has been closed 7 weeks but according to DI is still receiving 80 to 100 orders for new Saab cars each day. A proof that the car buyers still have confidence in Saab. Before the production was halted Saab received 200 to 250 order each day. The aim is to restart production next Friday with a production of about 100 cars each day. The same day a delegation from Pangda Automobile is expected to visit the factory. To restart the factory EUR 90 million is needed. Saab has already received EUR 30 million from Gemini Investment Fund Ltd and another EUR 30 million from Pangda Automobile. In addition, Spyker Cars has utilized the GEM Global Yield Fund Ltd facility which will raise around EUR 4 million. But Saab also needs the EUR 29.1 million from the European Investment Bank. But as usual the EIB is taking its time. At the general meeting of shareholders in Spyker Cars this afternoon, Victor Muller said that a new CEO for Saab will be announced soon. Jan Maarten Slagter, CEO of VEB, attended the meeting and he got the impression that Muller and the board is talking to a candidate and that a announcement of a new CEO is near. But no name where mentioned. To Svenska Dagbladet Victor Muller says that a new CEO may be announced soon, but it can takes months before a new CEO can start as most people qualified for such a position already has a good job which they can't leave immediately. Could that mean that the new CEO will not be from inside Saab, but an external person? Victor Muller also said that he hopes for a restart at the Trollhättan manufacturing plant on Friday next week. Signals he has gotten from the people at Saab working on restarting the factory are good and the aim is a restart next Friday when also a delegation from Pangda will visit the factory. Muller: Never before been as embarrassed as when the Hawtai deal was canceled. Muller: Pang Da is a great deal. Provides access to the largest car market. Muller: sale and leaseback of Saab property is still planned. Can now be done without time pressure. We are almost ready with new CEO for Saab. According to Reuters, Pangda Automobile Trade Co. aims at opening 50 Saab outlets in China this year. Wang Yin, Pangda's board secretary, said this to Reuters in a phone interview. Wang continued by saying that the annual China sales target for Saab is 10,000 imported units this year, depending on Saab's output level at home. It was also revealed that Pangda aims to set up a manufacturing venture with Spyker Cars and a partner in China this year and to start local production in two years. To Auto Sohu Pangda’s CEO and founder Pang Qing Hua said that Pangda will search for a manufacturing partner or China's National Development and Reform Council (NDRC) will recommend one. In the contract with Saab, Pangda has the right to choose and suggest a partner but Saab has the right to refuse a partner, but Saab has no right to choose a partner. So basically if any Chinese company wants to produce Saab’s in China, they have to go through Pangda. Pangda also seems to be eager to import Saab's to China, a responsibility China Automobile Trading Company (CATC) has at the moment. But the deal CATC has with Saab for import can according to Pangda be cancelled at the end of this year.